Carpets are great things. They can add a touch of warmth to a room. They’re comfortable and pleasing to the eye, coming in a number of patterns and colours. There are all sorts of textures available too. However, keeping them like this for years to come requires maintenance. You call on us regularly to conduct a thorough, effective cleaning. During that process, people tend to ask questions. After all, not everyone is an expert on how to clean carpets and rugs. One of the most frequent questions people ask when they call for carpet cleaning services is “how often?” Do they need to clean their carpet daily? Is it a monthly thing? Do they need to do it a lot more often than that? Well, for obvious reasons, it’s not a daily priority. Carpets, even ones made of fibres that are more prone to staining and retaining dirt, don’t need daily cleaning. A quick vacuum is usually enough. However, if you’re looking to keep the carpeting and rugs looking their best, a routine should be established. There are a number of factors to consider, of course. For example, there’s the matter of foot traffic and what sort of debris and materials you can expect to make contact. Now, vacuuming daily is probably a good idea. It helps minimize the risks and doesn’t let too much grime and dust pile up just out of sight. If the area only sees light traffic, you can get away with a weekly vacuuming sweep instead. If you vacuum weekly or daily, how often should you call for a deeper cleaning? For residences, it’s advisable to get a deep clean once a year. For rooms and areas that don’t get a lot of people coming in or out, or if you don’t have children or pets in the home, once every eighteen months is a good move. If the area is more high-traffic, change mindsets. Areas like carpeted hallways and family rooms should get more frequent cleaning. Once every six months is a good move. If there’s soiling on the carpet, you change tactics. Cleaning and removing both the stain and the source of it right away is the best move. Remember to blot, not rub. 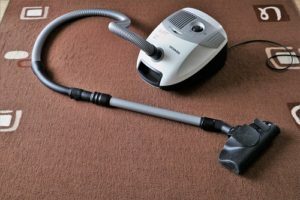 After the professional cleaning, how often should the vacuuming happen? That’s a follow-up question that can be surprisingly difficult in some situations. Maintaining a regular, reliable cleaning protocol on a new carpet is important. It prolongs the life of the investment, after all.